Vascular graft procedures are minimally invasive besides involving repairing vessels from the inside as compared to other conventional vascular surgical procedure. In vascular graft procedures, Catheter-based devices are introduced through a minor incision and are directed with the aid of real-time imaging technologies. Globally, development of efficient and advanced novel products using tissue engineered, and biological materials, rise in the awareness among people regarding peripheral artery diseases and coronary diseases, increasing government initiatives across the globe, growing prevalence of cardiovascular diseases such as hypertension, coronary artery disease, and cardiac aneurysms, and increasing prevalence of diabetes around the world are the prime growth drivers of the vascular graft market. 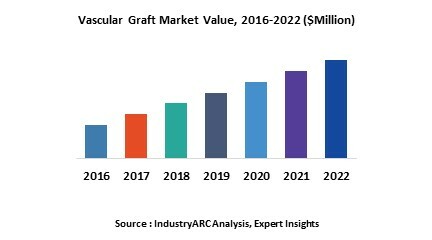 In addition, an increase in adoption of vascular graft in emerging economies such as China, India and others, will create new opportunities for the vascular graft market. However, higher cost of the research and development, and higher cost of vascular graft procedures are the key restraints for the vascular graft market. Geographically, North America dominated the vascular graft market, due to high medical reimbursement facilities, and technological advancement. Asia Pacific is projected to have the fastest growth, owing to a rapidly increasing geriatric population, rise in consumer awareness, increasing healthcare expenditure, favourable government policies, modernization of healthcare infrastructure, and growing medical tourism industry in developing nations such as China, and India in this region. Among all the applications, cardiovascular diseases has the highest market share in the vascular graft market due to higher prevalence of hypertension, high blood sugar and other age-related risk factors. This report identifies the vascular graft market size for the years 2014-2016, and forecast of the same till the year 2022. It also highlights the market drivers, restraints, growth indicators, challenges, and other key aspects with respect to the vascular graft market. 11.2. Bard Peripheral Vascular Inc.
11.5. Junken Medical Co., Ltd.